The Craftsman style home of Tia Landau, owner of The Albert restaurant located in the Little Five Points Area of Atlanta, was one of the featured homes on this year’s Inman Park Festival Tour of Homes. When you meet Tia you know you have met a very special person. She is small in stature but big in personality. She is a stylish, energetic, full of humor, brown haired flower child of a woman. But don’t let her care free nature fool you; she is a talented and serious business woman that runs one of the most successful restaurants in Atlanta. Now that the Tour is over, we can walk room by room and share some of John Ishmael’s, the lead designer on the project, favorite design tips. Scale is always an important part of design. By bringing the drapery up as far as possible in the condo, the space looks and feels grander, and it takes advantage of the high ceilings. You get that wow factor when entering the dining room. Bringing a large reclaimed wood dining table into the space provides gracious amount of seating and acts as a grounding feature in the room. Composition is all about putting products together in an aesthetically pleasing way. We needed a sophisticated livable space, so a mix of tans, grays, and blues acts as the base pallet and orange provides the pop of color and interest in the space. More neutral pieces, like the sofa and the chairs, are perfect canvases to handle the bold color of orange. By spreading the accent color around the room in the art and in the bookcase, the room looks pulled together and polished. Keeping elements of the Craftsmen style was of utmost importance to Tia and I. We then incorporated glamorous and more contemporary pieces to add interest and to showcase Tia’s eclectic style and personality. The original doors and trims were kept stained which is traditional craftsman, and the wall’s were lightened to reflect a more modern take on this classic style. By mixing the finishes of the more modern pieces, like the chrome arched floor lamp in the living room with the rustic wood slats of the coffee table, the room looks less cookie- cutter and bland and more eclectic and exciting. Overall, it was a super fun project with a great client.Were you a fan of Tia’s condo on the tour? Let us bring out your style today and leave us a comment! Tia owns the popular Inman Park Bar & Restaurant, The Albert. She named her bar after her son. Her son was named after Albert Einstien, her father’s godfather. Yes, Really! If you came to the Tour of Homes you may have even gotten a peak of a picture of the physicist himself, holding Tia’s father as a baby! Keeping with our client’s style is what we strive to do best. A mix of glam, modern, and rustic elements all come together in this Craftsman bungalow condo. We added Southwestern inspired rugs to ground the space. While bringing in more adequate lighting in dark corners made the space come to life. It is the mixing of all of these design components that lended itself to creating a functional and inviting home. 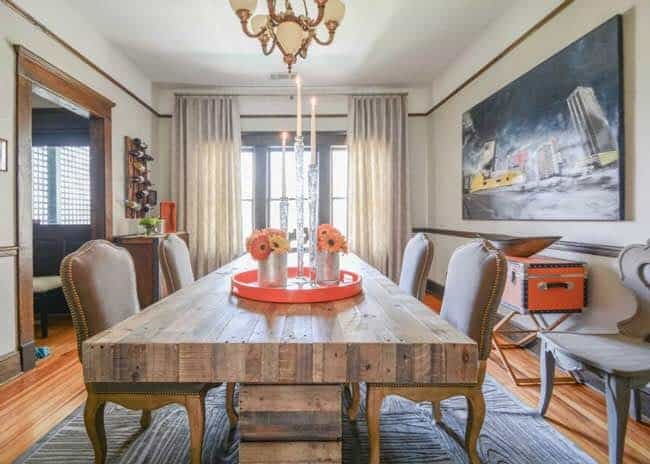 The dining room features an amazing 89″ dining table, built from salvaged wood. This was definitely a star on the Tour of Homes. The host chairs also took center stage, the over sized nature felt appropriate in the large dining area. All photography was done by Troy Farina.